Boston Dynamics, an engineering company founded by Marc Raibert and his colleagues in the year 1992, have developed dynamic robots and its software for human simulation. Several innovations were made by them college life in Massachusetts Institute of Technology. They excelled in the field of robotics and developed robots that could run and epitomize all basic characteristics of animals. Lately, the researchers at the Boston Dynamics lab developed an anthropomorphic robot called Petman. 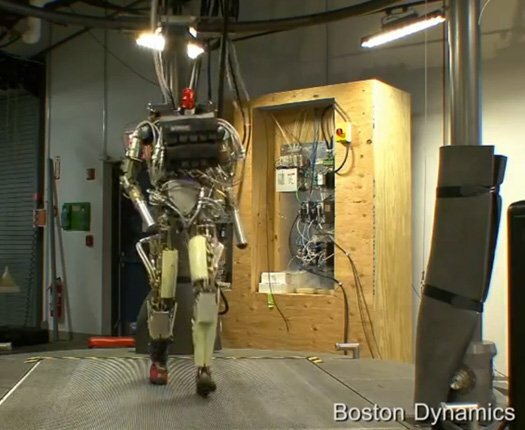 It is a two-legged, upright robot designed to stand and walk like a man. The main aim of the machine is to test chemical warfare clothing for the US army. The robot replicates the same motion of a human being and is able to move at a speed of 3.2 miles/hour. Besides the regular motion of the robot, it has also been programmed to demonstrate some basic workout methods like – treadmill walking, push-ups, squats, lunges and some simple calisthenics. From the video below, you can see the robot balancing itself when it is pushed while running on the treadmill. It took almost 15 months for the designers to design this wonderful machine, and 15 more months to build it.